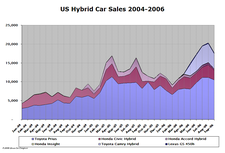 Sales of hybrids in the US in October rose to 18,784 units, up 10.9% from the 16,934 sold in October 2005. The October 2006 tally does not include sales of GM’s VUE Green Line Hybrid—GM is not yet breaking out those results separately. Total light duty vehicle sales in October in the US increased 6.1% from the year prior, with sales of light trucks up 14.8% and sales of passenger cars down 2.9% year-on-year. In October, hybrids represented 1.54% of the new car market—an increase from the 1.48% share in October 2005, but a decrease from the 1.72% share in September 2006. Toyota sold 8,733 Priuses in October, a decrease of 12.1% from October 2005. Sales of the Camry Hybrid dipped in October to 2,806 units, the lowest full month total since the vehicle’s sales launch in April 2006. The Camry Hybrid represented 8.3% of total Camry brand sales in October, down from 10.6% in September and 11.8% in August. 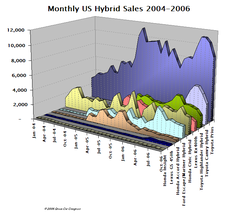 The Highlander Hybrid posted 1,643 units, a drop of 29.5% from October 2005. The Highlander Hybrid represented 16.0% of total Highlander sales, down from 20.1% in September and 21.2% in August. The Rx 400h posted 1,239 units, a drop of 34.9% from October 2005. The Rx 400h represented 17.1% of combined Rx 400h/Rx 350 sales, down from 19.4% in September, but up from 15.4% in August. The luxury GS 450h sedan posted 177 units, representing 86.8% combined GS 450h/GS 430 sales, up from 74.2% in September. The October results represented 8.9% of all GS model sales, up from 6% in September. The Ford Escape and Mariner hybrid posted 1,602 units, up 30.6% from October 2005. The Ford hybrids represented 13.6% of total Escape and Mariner sales, an increase of .6 percentage points from September 2006 and a full percentage point from August 2006. Honda sold 2,288 units of the Civic Hybrid, up 890% from October 2005 (the unusually lowest month in 2005). 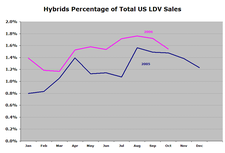 The hybrid sales in October 2006 represented 10.7% of all Civic models sold, up from 9.5% in September and .1 percentage point off of the 10.8% in August. 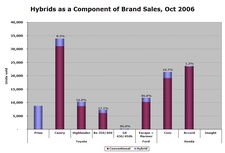 With 287 units sold, Accord Hybrid sales were the lowest of 2006, down 77.3% from October 2005. Hybrids represented 1.2% of all Accord models sold in October, a drop from 1.7% in September and .2 percentage points lower than August. The Insight, phasing out, posted 9 units. Hybrid car sales. 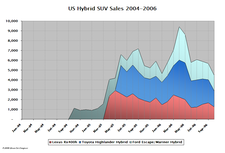 Hybrid SUV sales. Hybrid sales as a component of total model sales. Hybrids as percentage of total light-duty vehicle sales. Anyone know when the hybrid extended base Lexus LS will be available? (LS600h L) It would be interesting to see the sales volume for that particular model. It would seem hybrids were not adversely affected, by lower gas prices, as one would had feared at first. We would still have to see Nov and Dec numbers, but the omission of Vue microhybrid and the upcoming model rollouts, make prospects promising. Good to see more people buying hybrids, but it turns out they actually cost more in terms of total lifetime energy use (production, use, disposal) than many other mass produced gas-only cars (including several SUVs). Check the link for more info. Certainly not a scholarly source, but interesting nonetheless. You can also google the topic and find more articles. The Oct. sales number is down 20% from Sept's. Isn't that remarkable? Are people staying away from HEV as oil price catchs a short breathe? Compare year vs year not month vs month. Oct 2006 is ahead of Oct 2005. That is how the industry compares it's sales, and help them determine how well they did. Another point is Aug, Sept, and Oct 2006 all did better vs same period 2005, and w/out the sticks this year, namely monster hurricanes whacking the Gulf. _Yes, Oct was down vs Sept, but the Vue microhybrid was not figured in. We have to see how it did too. People are still buying hybrids but it also seems the people who were scared of high gas prices and didn't buy any cars at all (rather than turning to hybrids from the downturn in overall light duty vehicle sales of the past few months) are coming back to buy mainly trucks and SUVs as that is where the rebound is happening most strongly. I've read some of those reports on total life time energy usage and they appear to have some very suspect assumptions. For example, they emphasize the R&D costs for hybrids. Plus it is interesting to look into who commissioned these reports. I remember reading a rebuttal by Toyota stating that a lot of the facts were misrepresented regarding their product line up. However, this to me is somewhat relevant as the thing that I think will have the bigger short term impact will be oil and natural gas shortages. So anything that reduces our dependence on these is a good thing. Not to mention reducing our dependence on unfriendly suppliers of oil. I agree in the long term, maximizing full life cycle energy efficiency is definitely required. I would also add that early assumptions were way off on resale value. The prius and civic hyrbids appear to have the lowest first and second year depreciation on the market. Consumer's Reports some months ago came out with a big headline indicating effectively saying that hybrids weren't worth the extra money economically (based on gas prices similar to todays). Then someone noticed that they had made a huge accounting error. They had included the initial purchase price and depreciation in their hybrid costs. The retraction was buried in small print on the inside of the following months issue. Would it be possible in the future to add a multi-line graph (this style: http://bioage.typepad.com/photos/uncategorized/hybrid_sales_oct06_5.png ) with the overall sales figures? This would make comparisons with the same month of previous years much easier. Re: multi-line graph for total sales figures...done. I've replaced the first area graph with the multi-line graph with overall sales figures. Thanks for the suggestion...it does make year-year comparison much easier. It is always good to be a bit skeptical at what you read. Sometimes things are not as good than at first glance. OTOH, sometimes you have to dig, and find things are way better than you could ever imagine. The Consumer Report computational snafu was in between. What happened with the graph that showed sales by model? I remember one lifetime energy use research (published, as I remember, at CALSTART), which claimed that Hammer overall consumes less energy per mile then Prius. There are other publications of same credibility. to be honest, these numbers are depressing. yes, they ARE up from last year, but WHAT is driving these numbers up? the GS, Mariner/Escape, and Civic. all of the toyota models are down compared to last year. this only goes to show you that gas prices do affect sales and that once people stop feeling the money pinch in their pockets, they resort back to their gas-"guzzling" habits. i think it's interesting that the GS is going up so strong. my guess is that this highlights the fact that currently their numbers are limited by production and not demand. lastly, @Patrick about the Lexus 600h, expected launch time is sometime in 2007. my guess would be no earlier than may or so. As a slight cynic, where does the energy taken to recharge batteries come from when the battery is charged from an external source? What is the efficiency transfer? Is pollution being created elsewhere? What proportion of the weight is taken up by the battery? What implications does this have in establishing HOW the energy is used? I presume that "Hammer" means "Hummer". Now seriously, what kind of ridiculous assumptions are being made to generate this preposterous claim? The Hummer outweighs the Prius by about a factor of 3. This sounds like something that was cranked out by one of the right-wing "think tanks". I would refrain from claiming political orientation of Hummer/Prius energy use research results, but BS is BS, no matter to whom one stick this smelly stuff. A link to one of these publications would help YOUR credibility. The major advantage of hybrid is in city mode. Did somebody estimate polution from cars in big cities? I think this offset other costs, I would like to live/work in a clean city. There is the issue of recycling these hybrids. As with most other vehicles when junked, they are melted down for their component metals. This may result in an interesting scenareo, with Prius and Insight models, from the early years of this decade. The prices for steel and other metals have gone up since then, and thus are now worth more. The article that you linked to is based on research done by a marketing company, is this the best you can do? The Sierra/Silverado hybrid pickup is supposed to be available, retail not just commercial or govt in 2005. I do not see any numbers on the net.